With an approach that is both classic and timeless, Brent Donaldson generates more than just enviable curb appeal—he creates spaces for real living. There is an old saying that if you can make a living doing what you love to do, it will never feel like work. 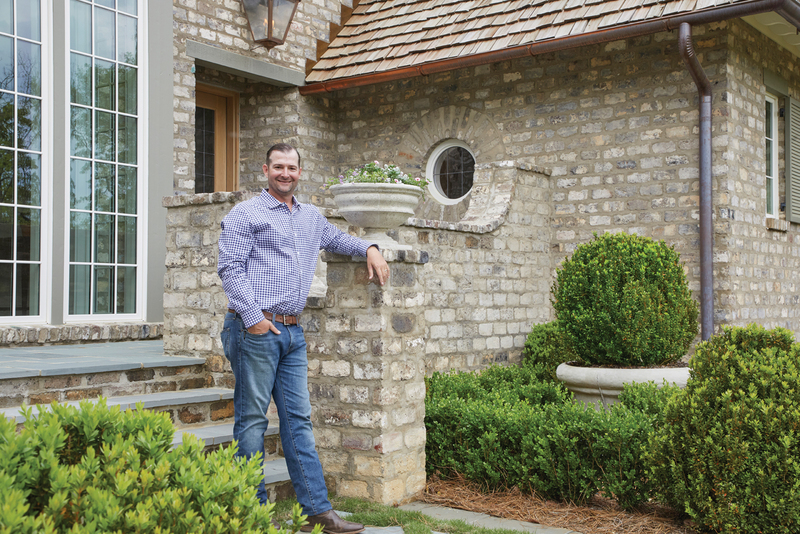 Brent Donaldson of Donaldson Landscape & Design is living proof of that adage. “Honestly, in my down time, if I’m not playing with my kids, I’m drawing landscape plans or going through landscape design books, ” he says. No matter where Brent goes, he looks for—and finds—inspiration at every turn. Whether traveling to the beach or New York City or Austin, Texas, the designer comes home with new ideas. “I like to re-create interesting things I have seen on my trips, ” he says. More than just a designer and installer of plant material, Brent can tackle almost any part of a home’s exterior. From building arbors and creating hardscapes to improving drainage and installing uplighting, his design arsenal has breadth and depth. And his work is intentional and with purpose. “I’ve had clients call me to redo the yard of a house that they have just purchased, ” Brent says. “I always tell them to live in the house and in the yard for at least a year before making any major changes. They need to see how they use the space. We want to create an exterior design that works around the way they live, not the way the previous owner did.” And while this approach may seem unconventional, Brent’s clients can vouch for the fact that it has stood the test of time. After all, for this landscape designer, the end result is about more than just beauty— it’s also about functionality. I work with a lot of younger families who want their yards to look clean and streamlined. They don’t want ‘fluffy’ landscaping with layers upon layers. These streamlined designs have the added benefit of being easier to maintain as well. One of the ways I implement this approach is to take three 36-inch concrete pots, add boxwoods and uplighting, and place them in a neat row, maybe in an area with pea gravel. It’s simple, but it makes a statement. It took me a long time to realize that I need to trust my first instinct on a design. I can look at a piece of property and just know what I want to do and what will work. It just flows. I am lucky that I have clients who trust my instincts as much as I do.